I was checking the weather tonight to see if there was going to be any rain tomorrow morning (it appears that will be the case) and saw that Weather.com dumped their proprietary mapping and is now using Virtual Earth. I had seen some Virtual Earth maps on Weather.com, but this is the first time I’ve seen it as the default map. 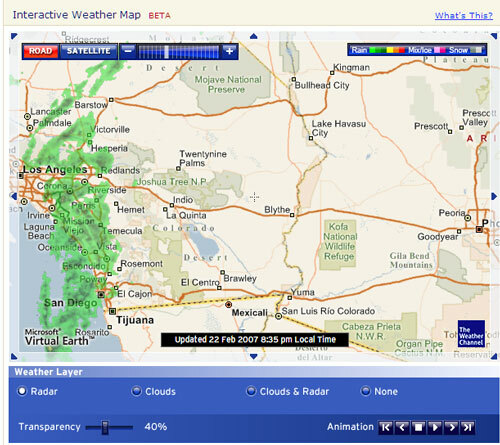 It appears that Weather.com is using a Flash overlay on top of the Virtual Earth maps (double click on the map to see a cool zoom-in animation). The interface works really well and you can control the radar and cloud layers as well as the animation. And of course don’t forget you can also view the satellite image in the background if the road map isn’t your speed. 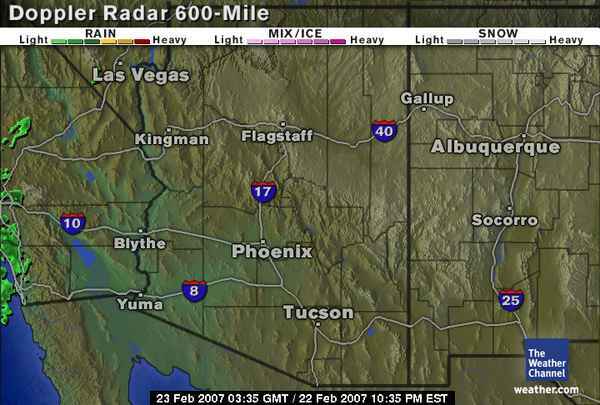 Compare the new maps to the “Classic” Weather.com graphics. Quite an improvement! Kudos to the Virtual Earth team for getting their product out there. Shows what a more liberal licensing policy can do for a product. Can’t wait to see when they integrate VE3D into their maps. 3D clouds and rain falling should be pretty slick. Update - The Virtual Earth (MapPoint) B2B Blog has some thoughts too.